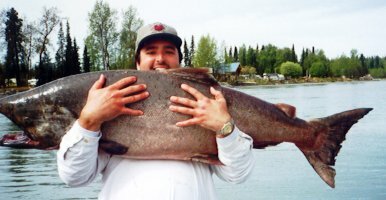 Each Year 80 Pound Fish And Bigger Are Taken"
Don't Just Fish For King Salmon.....Fish "Our Kenai River Big Game King Salmon"
"Kenai River" King Salmon Are "Size ~ Wise" Unique ! King Salmon - 75 lbs. 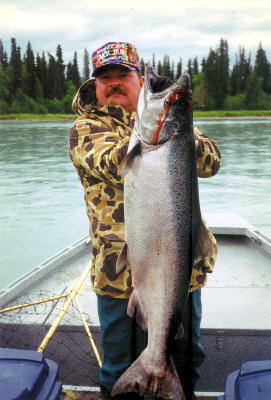 in "Kenai River"
L@@K forward to fishing for "The Biggest King Salmon In The World" ! "We had an absolutely fabulous trip with you. You are a professional in the truest sense of the word. Your Best Chance To "Retain" The Most King Salmon. Enjoy Spring At Home & Come To ALASKA & Do It Again ! 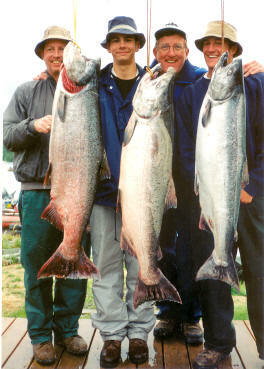 World Record King Salmon, 97 lbs. 4 oz. 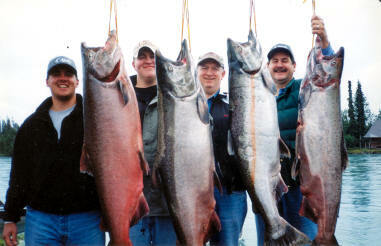 more than one day of Halibut Fishing because you will also be fishing for King Salmon. Limited Availability ~ First Come . First Served ! They're All "Picture Perfect" ! On A Mission To Spawn & "Attack" Lures In Their Face !!! as they are just "passing by" and not stopping to spawn in the lower section of the rivers. destined for the Kenai River. or at our mooring facility. We Can't Take Everyone "King Fishing", but We'd Sure Like A Good Shot at You !